MFC-CB is a compact and versatile, stand alone unit for setting and reading analog mass flow controller (MFC) and mass flow meter (MFM) instruments. Its front panel keypad and display make it suitable for manual, bench top operation. It also integrates into automated, computer controlled systems using its RS-232 or IEEE-488 interface. MFC-CB is the standard analog voltage and current setting and measuring component in Fluke Calibration molbox RFM™ flow calibration systems. It can also be useful as a stand alone device in a variety of measurement and test systems that use an analog mass flow controller or mass flow meter. 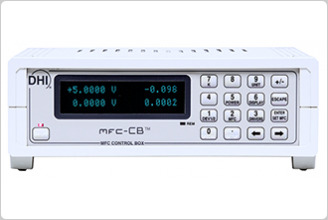 MFC-CB is a stand alone control unit for setting and reading voltage and current to and from MFCs and MFMs on two channels simultaneously. An optional MFC Switchbox allows switching between up to five devices on each channel that can all be continuously powered. A 4 x 4 keypad and 2 x 20 character display support local operation. Standard RS-232 and IEEE-488 interfaces allow remote communication. An additional RS232 interface (COM2), is available for pass through communications to another device. Current measurements are made by dropping the voltage over a precision 250 ohm resistor. The set point output is automatically corrected based on an independent sense line measurement at the device being set. MFC-CB uses MFC profiles as a convenient way to support advanced features. MFC profiles specify electrical signal and flow range allowing MFC-CB to support set point entry and measurement display in electrical, % FS or flow units. In addition, two units of measure can be displayed simultaneously and the sum, difference and ratio of the two control channels can be determined. MFC gas conversion factors can also be entered and applied automatically.